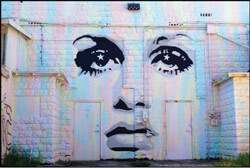 A phenomenon in play since 2010 – dovetailing with the refurbishment of the Crislip Arcade and the re-branding of the 600 block of Central Avenue as the Central Arts District – the mural scene here has been on a steady upward trajectory for the past five years. It’s so hot, in fact, that it took a mere matter of months to pull together the epic SHINE St. Petersburg Mural Festival, held this past September. For SHINE, artists from all over the country – and as far afield as Toronto and Rome – alighted on our city, happy to mount works alongside such renowned St. Pete creatives as Bask, Chad Mize, Pale Horse, Tes ONE, and the Vitale Brothers. Take a SHINE favorite, Eye of the Storm by Northern California graffiti guru Ricky Watts, as just one example (shown above). Measuring a whopping 96’x39,’ the swirly beauty, located at 600 1st Avenue North, required a staggering 500 cans of spray paint, according to John Collins, executive director of the St. Petersburg Arts Alliance. Another SHINE mural winning raves is the hauntingly beautiful portrait of a young girl reclining against her muzzled pooch at 1246 Central Avenue. Like many SHINE works (and street art in general), this one doesn’t have a title. But it does have a hell of a backstory, says Diane Shelly, executive director of Florida CraftArt and a driving force behind SHINE. Evidently Evoca1 practices what he preaches. 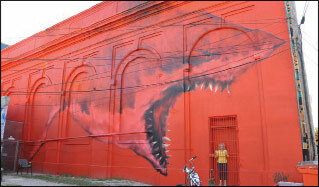 According to Shelly, during the week he spent in St. Pete painting his mural, he kept his wife and child nearby the entire time. Given how much blood, sweat, and tears goes into some of these murals, it’s only fitting and fair that they get to stick around for a while. Unlike a typical exhibit at a museum or gallery, which dazzles and captivates viewers mainly only during the time-frame they’re seeing it, outdoor art doesn’t quickly fade from memory. We literally live with it, catching it in our sightlines every time we pass by on foot, bicycle, or car. Sure, they can be can completely painted right over at some point. And they can also slightly morph over time; a few of the older murals in the primary ‘art alley’ behind the 600 Central block are slowly getting gently tagged by guerrilla graffiti types. 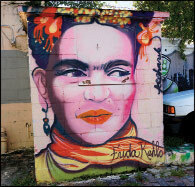 Still, there’s an element of civic pride that helps keep St. Pete’s murals intact. And in the case of SHINE, there’s an outright year-long commitment. Under a dual-ended agreement between the SHINE steering committee and the building owners who graciously granted access to their walls, the works can’t be touched until next fall at the earliest. And by that time, the sequel will be well under way. 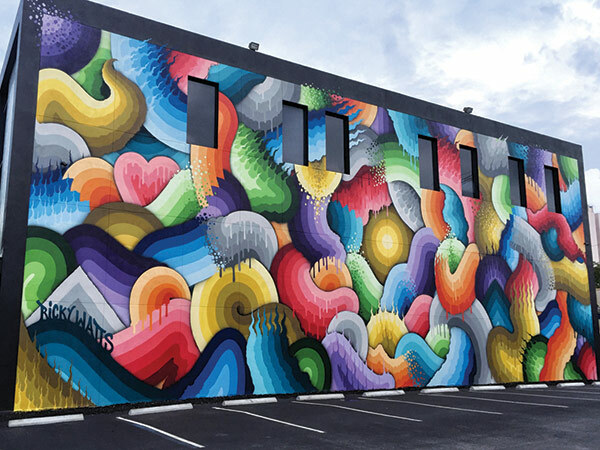 One of the reasons the first incarnation of SHINE went so smoothly – and the fact that St. Pete has long been the proud host of some of the best mural collaborations anywhere – is the intense spirit of teamwork our native creatives bring to the table. 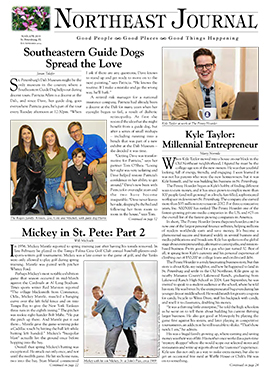 Rather than competing so fiercely that they won’t work together, St. Pete’s artists are happy to cut everyone in on the action – even those from out of town. 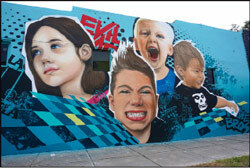 Because a few of the SHINE artists had never done murals before, St. Pete’s Vitale Brothers really stepped up to the plate to prep walls and lend a helping hand. They also contributed a splashy work of their own, featuring a bunch of punk rock babies in mohawks and skull T-shirts, at 2063 Central Avenue. “We kept the Vitale Brothers really busy,” says Shelly. Of course, all that SHINE pitching-in extended to St. Pete’s local businesses, too. As Collins points out, Courtyard Marriott couldn’t have been more generous in hosting the artists. Kawha supplied countless iced coffees, and the muralists were never without bottled water and other energizers to help them power through long, hot days (and nights!) of painting. In total, says Collins, there was north of $100,000 in in-kind contributions, including lodging, food, art supplies, printing, design, and donated artist fees. But, the event wouldn’t have happened without the fleet of volunteers who generously gave of their time to knock on business doors to secure walls and raise money, as well as a dogged steering committee led by Leon Bedore, aka Tes One. In particular, Collins credits Wayne Atherholt, director of the Office of Cultural Affairs, as a catalyst for SHINE. And thanks to an array of tours, the murals – SHINE and otherwise – are staying top-of-mind for both visitors and residents. And some of them, including eight trolley- and two bicycle-tours, have even served as fundraisers for SHINE 2016. For those who really want to get up close and personal, a walking tour, such as the one offered every Saturday morning by Florida CraftArts, might be the best bet. Typically led by a local artist, the tours run about an hour and a half, and really delve into the ‘how’ and ‘why’ behind many of the works.